In December 2014, Sharefund was one of the few companies featured on the "Technologies for the Aging Space" page for the 2015 CES Digital Health competition sponsored by Everyday Health. 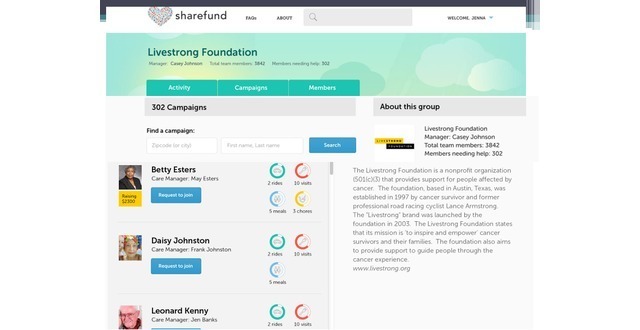 In July 2014, Sharefund was a semi-finalist in the Livestrong "Big C" competition for cancer related technologies. 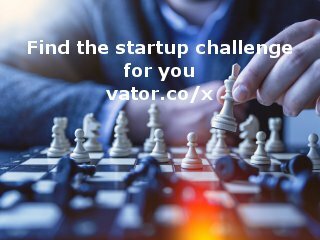 We were appointed a mentor to help us with the final round of the competition but did not move forward. We were only in beta at the time, while others had fully launched products. Get & give help for a family member or friend who needs it! 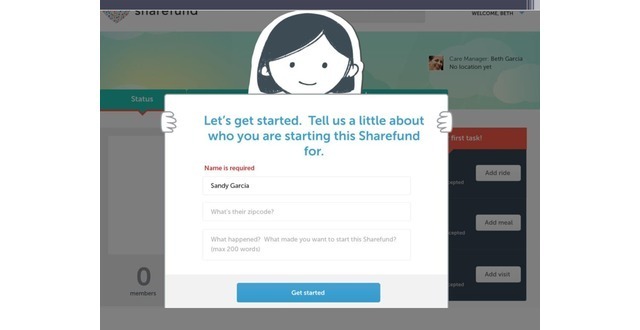 Use Sharefund.com to create a campaign, invite people, and get more help! Elaine specializes in New Product Development, from Ideation to Market Execution. Sharefund is a tool to help families taking care of seniors and chronically ill loved ones get more help. The service is free for users. When there is a health event, such as a fall for an elderly parent or a spouse is diagnosed with cancer, the burden of care falls on one family member/caregiver. This person feels overwhelmed and stressed. Over time the care recepients needs exceed the available time, skills and ability of the family careiver, leading to the Giving Gap. Community groups and for-profit vendors tend not to know who needs their help or product/service. This lack of qualified leads results in sub-optimal use of these resources. 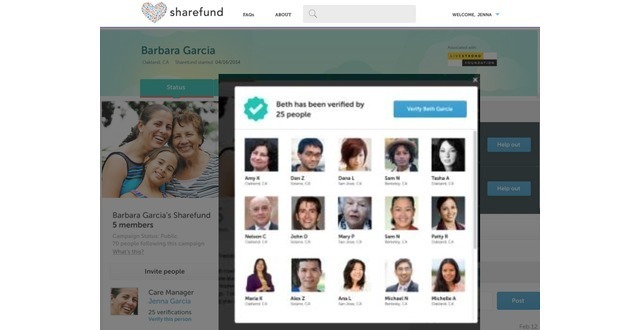 Sharefund offers a platform for all types of users - patient, family caregiver, family & friends, local community groups and for-profit vendors to interact to get and give more help. 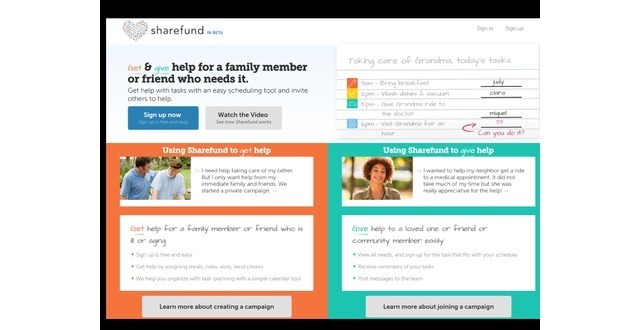 Sharefund plans to generate revenue through lead generation and white labeling. 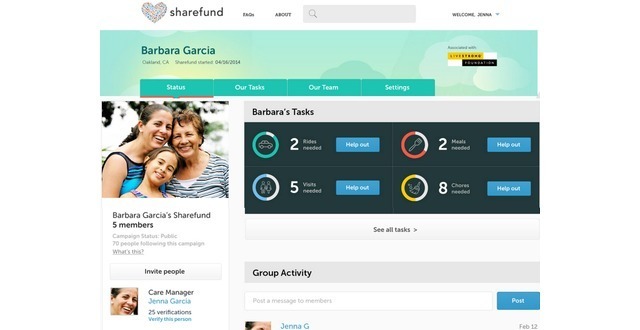 Sharefund will demonstrate value by providing access to qualified lead to care vendors. Sharefund plans to white-label its product to companies. Organization with large memberships, like large senior residents, may want to create a private Sharefund with their own label to engage their members to help each other. 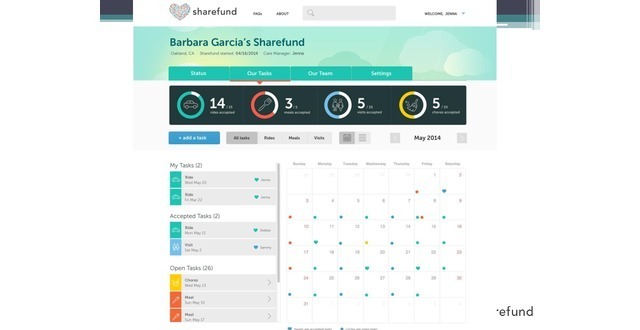 Sharefund has two type of competition: caregiver calendaring tools and crowd-funding platforms. Existing caregiving tools allow caregivers to calendar tasks and post messages to a team, usually immediate family members. Some examples of these companies are LotsofHelpingHands and CareZone. These applications tend to have more "corporate-like" interfaces targeted for a 50+ population. Even when caregivers spend the time to create tasks, the applications do not make it easy for team members to engage and for them to stay engaged. Crowdfunding sites are only geared to attract users for financial donations. They are all public accounts and are usually used for a short time period (2-3 months), whereas the average caregiving experience is four years. Opens the platform to various players, such as the not-for-profits, and vendors, community support groups. Focused on allowing the giver to give when it is convenient for them while also meeting a significant need for the patient.